Lambeth 1982 by Gordon Wilkinson & Sarah Faulkner. Household Paint?. Battered Boards of Lambeth History! Any time your Lambeth way, any evening any day, you'll find us all, looking at the murals on Lambeth Walk!. This street, made famous by this song is a shadow of it's former self -many of the shops are closed and much of the development around the area is modern. Set back from the street is a small area which has 5 wooden panels showing pictures of things associated with the area. The first is very deteriorated but has images of famous Lambeth people associated with the music halls -such as Dan Leno and Charlie Chaplin. If anyone can identify the others, please drop us an email. 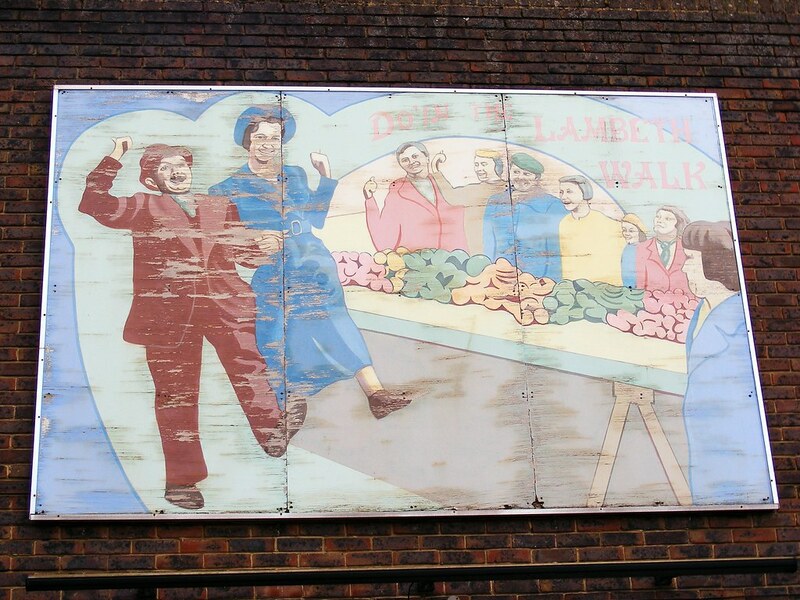 A second panel shows a bunch of south Londoners doing the Lambeth walk. A row of people stand behind vegetable stalls which represent the street market which had been on that site. A third panel is about the Lambeth Ragged School, a free school for poor children created by Henry Benjamin Hanbury Beaufoy in 1851 in memorial of his wife. A fifth panel shows the local Theatre association. The painting shows the Old Vic Theatre, Lillian Baylis, manager of the Theatre for 25 years and the Morley College, a place of learning which came out of the Old Vic. All of these murals are badly damaged which is sad because they reflect the important history of the area which on Lambeth Walk feels of little evidence. Perhaps the state of the mural reflects the state of the area. As these are on wooden panels, they have started to deteriorate. The wood is distorting and the paint is peeling away from the boards. From Vauxhall, take the 360 bus to Black Prince Road. Ask the driver to let you off near the Jolly Gardeners Pub. When you get off, you will be at the end of the Lambeth Walk. Take a stroll for a couple of minutes up the walk, past a row of shops and then you should see the murals.